Chuck and Patty Miller in the AT-6 gain on Ed Kornfield and Jane Dale flying the L-13 Grasshopper over the Kuskokwim Valley on the way to McGrath. These aircraft were only some of the rare planes that participated in the Alaska Aviation Centennial Celebration this summer. On this flight, we flew from Bethel to Aniak, and then to McGrath where we spent the night. 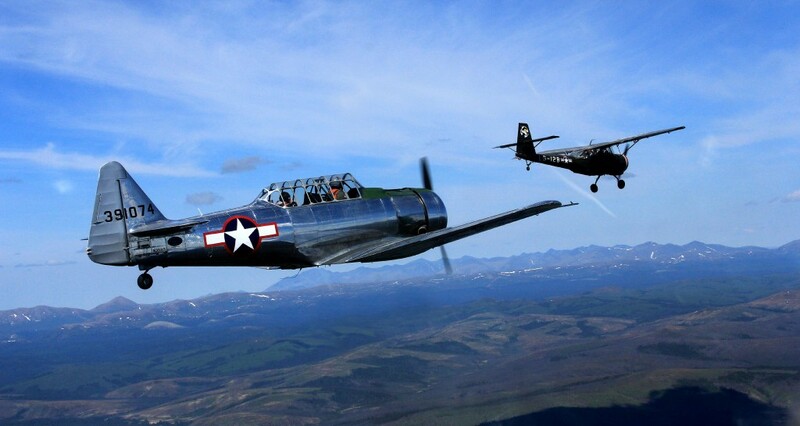 The AT-6 and L-13 are based at Merrill Field PAMR/MRI and can be seen flying just about anywhere in Alaska when the weather agrees. This image was shot from another North American AT-6 information and flown by Crickett Renner.